How to tell if what you’re reading or watching is still part of the JFK assassination cover-up. 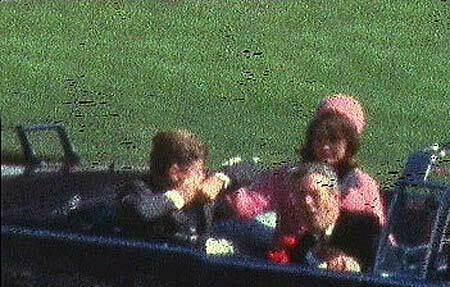 We’re all fairly aware now that this month is the 50th anniversary of the Kennedy Assassination. President John F Kennedy was murdered on November 22, 1963 in Dealy Plaza in Dallas, Texas. And boy, we’re being swamped with films, articles, videos and books about the assassination and the subsequent cover up. For example, both the History channel and National Geographic channel are throwing new films at us this month at almost a daily basis. So, how can you tell if what you’re reading or watching is still part of the Kennedy murder cover-up? Rule No. 1: If what you’re trying to observe or absorb portrays Lee Harvey Oswald right off the bat as the lone assassin. This is a dead give-away, as over the last decades, by far most assassination researchers have come to the conclusion even if Oswald was part of the murder team, he DID NOT ACT ALONE. This is fairly well accepted now. Although this is not accepted by the National Geographic programs, like the recent “Killing Kennedy” with actor Rob Lowe acting as the President. Even the Congressional investigation into the killing in the late 1970’s concluded that Kennedy was killed “probably by a conspiracy”. There was only about 40 to 50 witnesses in the Plaza that fateful day who believed at least some shots were fired in and around the Grassy Knoll. Be forewarned then when watching this NatGeo channel. Rule No. 2: If what you’re watching or reading insists that there were only three bullets fired in Dealy Plaza that Friday afternoon, with one of them – the famed “magic bullet” – striking both JFK and then also wounding Texas governor John Connolly who was sitting just in front of Kennedy in the Presidential limousine that day. This is also a give-away that it’s part of the continued cover-up. Most researchers – and many witnesses – know or believe there were at least FOUR shots fired, and as many as 6 or 7. For example, a bystander was slightly wounded by one bullet shot that day. So, that means at least four bullets. So, that’s a cautionary red flag waving in your face if what you’re watching or reading reports on only three bullets. Rule No. 3: If the show or book or article essentially favors or accepts the Warren Commission Report – another dead give-away. Again, researchers have found deep problems with the report that was issued ten months after the assassination. They made conclusions that were not based on their own evidence. And since the FBI controlled the investigation and evidence presented to the politically-charged Commission, the Commissioners never saw a lot of the evidence and material collected that was hidden from them. In addition, many leads that could have led to different conclusions were not followed up upon. Again, Congressional investigators over a decade later concluded the Warren Commission was incomplete in their investigation, therefore cannot any longer represent a sacrosanct body of conclusions. So, there you have it, 3 simple rules to aid you in wading through all the Kennedy Assassination material that is being thrown at us this November, the half century mark of one of the darkest days in American history. “JFK: A President Betrayed” was a fascinating program that did not focus primarily on the assassination. The people who shared information (including Khrushchev’s son) seemed credible: I’m so glad that some of those who served in the White House at that time were able to share their insights about important events. Thanks for providing your tips! I’ve been trying to read and watch everything that’s being throw at us. Watched Oliver Stone’s JFK film twice, Executive Action once, Parkland twice ….